“How to Draw…” books typically don’t impress me, but this is now the second book of this sort from Catherine V. Holmes that has excited me for what it is doing. Holmes breaks down a drawing so that it starts with very obvious, basic shapes and then she adds bits and pieces so that the basic shape begins to look like the intended object and she finishes it with shading. Sometimes the leap from basic drawing to finished, shaded drawing seems like a pretty large jump, but I haven’t yet read Holmes’ book about shading which might help the beginning artist make that leap. Holmes offers some very important tips in her foreword, including: draw lightly so that you can erase, and to step away from it for a while if it is going the way you want and are getting frustrated with it. This particular book, as the subtitle suggests, focuses on Holidays and special events. Holmes goes through it month by month, hitting all the major holidays and giving a sample or two of simple drawings to help identify the holiday. I really appreciate how simple Holmes makes this look, and yet her finished drawings look pretty spectacular. Mine don’t look quite the same, when I try these drawings, but that’s okay. She’s even says in her foreword that the reader’s drawings shouldn’t look exactly like her. In addition to the drawings and the step-by-step process, Holmes gives the reader a list of “Special Days” for each month so that the reader/artist can try making some different holiday/special day drawings. Reading these lists is almost worth the price of the book alone. Who knew (besides Ms. Holmes) that, for instance, in July we have a “Compliment Your Mirror Day” and a “Cheer Up the Lonely Day” and “Embrace Your Geekness Day” and many, many others? Looking for a good book? 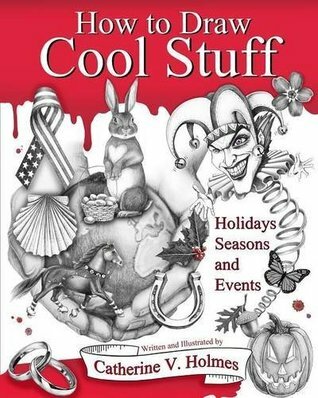 How to Draw Cool Stuff: Holidays, Seasons and Events is a great, “how to draw” book by Catherine V. Holmes that lays it out in simple terms, offers a great looking finished drawing, and prompts the reader with many fun holidays and special event days throughout the year.